I remember, as a kid, loving date nut bread smeared with cream cheese. 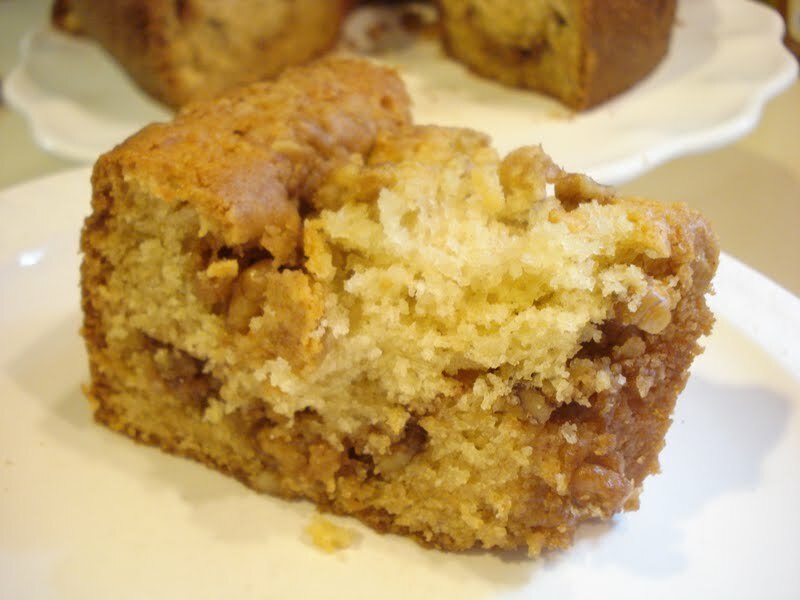 It was moist and full of great flavor from the dates, and, of course, the nuts, which gave it the crunch I always love! So when I found this recipe using molasses and dark brown sugar I knew it would be great. I had actually made another recipe I found in a cookbook I recently purchsed but it didn't have molasses or dark brown sugar in it and, as I should have figured out, it really wasn't very good. 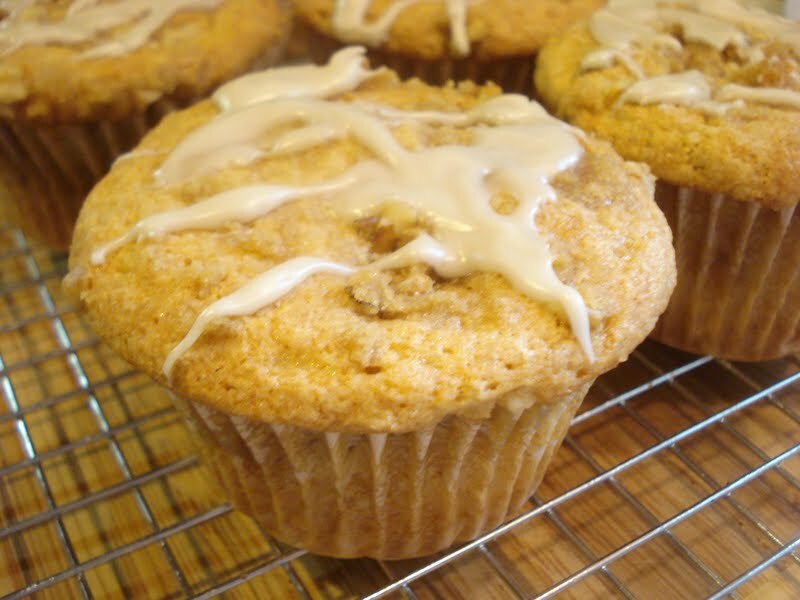 This recipe also uses whole wheat flour which is always a good thing in baking! If you remember the dark date nut bread that was available in cans, as I do, then you'll love this one. And if you don't remember it, bake it anyway! It so good. Don't forget the cream cheese! The recipe is quite easy to make. You need to add boiling water to the chopped dates and butter, puree one third of this, then add it back into the bowl with the rest of the dates/butter mixture. Then add the brown sugar, molasses and eggs and stir to combine. 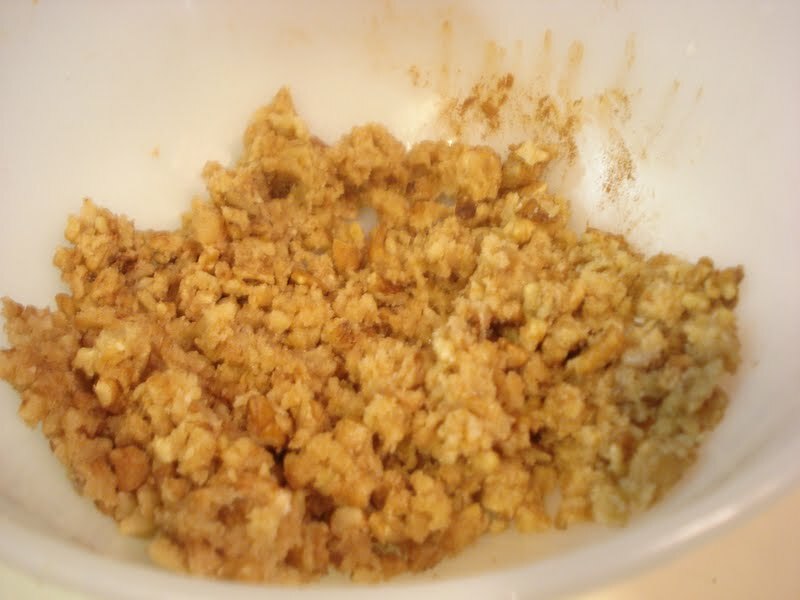 Combine the dry ingredients in a large bowl and make a well in the center. 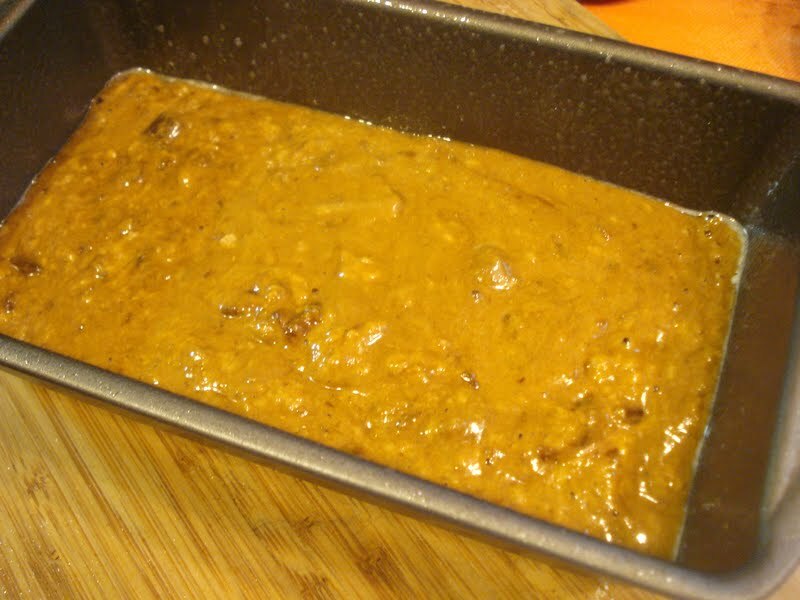 Pour in the date mixture and add in the nuts. Mix til it's all combined. Then pour the batter into a loaf pan and bake for approx. 50 minutes, or til a tester comes out clean. Preheat oven to 350. Grease a 9x5" loaf pan. Set aside. 1. 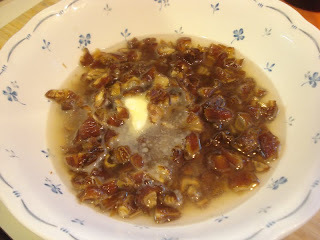 In a medium bowl, pour boiling water over chopped dates and butter. Stir the mixture and let it cool to lukewarm. 2. 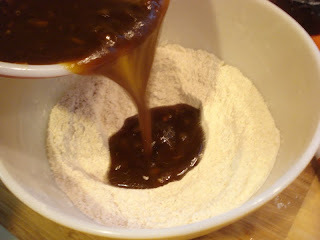 Pour one third of the mixture into a food processor or blender to make a paste, then stir it back into the date mixture. 3. Add the brown sugar, molasses and eggs and stir to combine. 4. In a separate large bowl, whisk the flour, baking powder, baking soda and salt. 5. 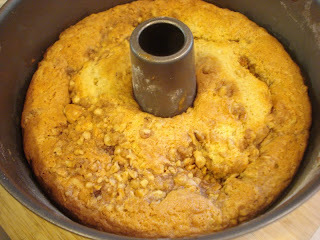 Make a well in the center and pour in the date mixture and the nuts and mix til all the ingredients are combined. 6. Pour the batter into the greased loaf pan and bake for 50 minutes, or til a toothpick inserted into the center comes out clean. 7. Cool the bread 10 minutes in the pan, then turn it out of the pan to finish cooling. 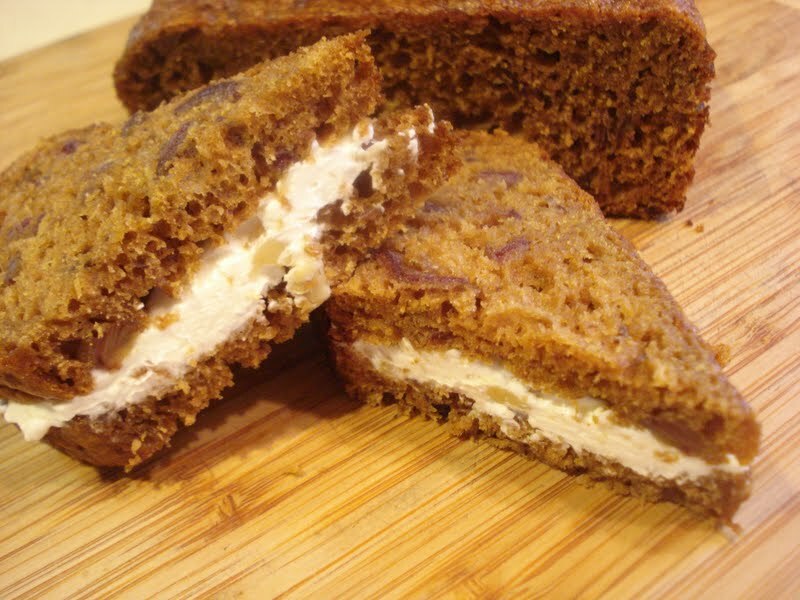 Spread slices with cream cheese. Enjoy! This is actually a retro coffee cake recipe from 1959. Apparently it has been served in high schools in Los Angeles since then and it's still made. Any cake still going strong after that many years has got to be good! And it is. 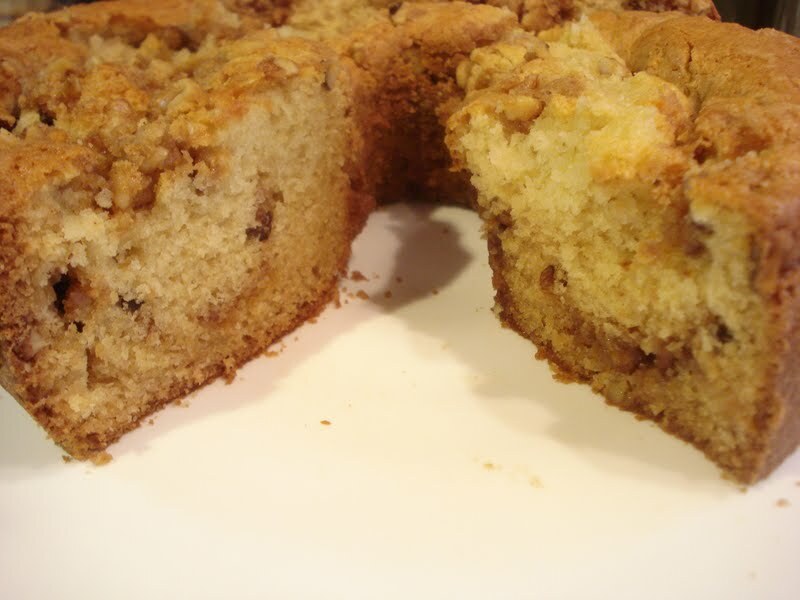 It's easy to throw together and it has a layer in the middle of brown sugar, butter and walnuts and, of course, the sour cream makes it nice and moist. It's one of those cakes that gets better the next day, and then the day after that..and so on! If I made one little change, it would be that I'd cut back on the amount of filling. It seemed like a little too much, but other than that, it's great. Make the filling first, then set it aside while you make the cake. After half the batter is in the pan, sprinkle the filling over top, then spoon the remainder of the batter over that, then finish with the rest of the filling ( well, now it's the topping!). The cake bakes up and around the filling, making it so delicious. So here's the thing...when I went to flip the cake over, it fell! I was able to save all of it but it didn't look as pretty on one side so I made another half batch, this time making the batter into jumbo muffins. I only got 5 out of this half batch. They were also great. And I put a quick maple glaze over the muffins. It's not really necessary but kind of looks pretty! Just combine 2 -3 tablespoons of maple syrup with 1/2 cup of comfectioners' sugar til it gets a thin consistency, then just drizzle over top. Preheat oven to 350. Butter and flour a 10" tube pan. All ingredients should be at room temp. 1. In a small bowl make the filling by combining all the ingredients together with a fork or your fingers, making sure the butter is thoroughly worked into the mixture. Set aside. 2. In a medium bowl, combine flours, baking soda, baking powder and salt. Set aside. 3. 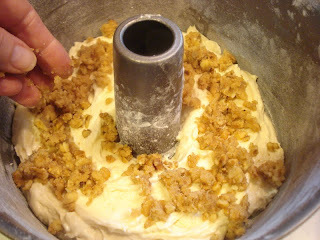 In a mixing bowl, cream the butter and sugar til light and fluffy, about 2 minutes. 4. Add the egg and vanilla and mix well. 5. Add half the dry ingredients and mix til just blended, then add in the sour cream. 6. Add in the remainder of the dry ingredients and mix til it's all incorporated. 7. 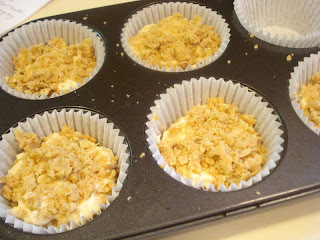 Spread hald the batter into your prepared pan, then sprinkle half the filling over top. 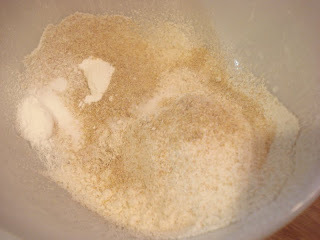 Spread the remaining batter over this and finish by sprinkling the top with the remainder of the filling. 8. Bake for 40 to 45 minutes, or til a toothpick inserted into the center comes out clean. 9. Let the cake cool in the pan for about 15 minutes, then remove it from the outer sides of the pan and allow it to cool completely. Turn it over...(very carefully!) then turn it again so it's right side up.